Severance of Lands from Houses. E. of Oxford, D. of Somerset. Premunire. Holidays and Fast Days. HODIE 4a vice lecta est Billa, for the keeping of Holidays and Fasting-days, que communi omnium Procerum Assensu conclusa est. Eodem die, 3a vice lecta est Billa, for the taking away of Premunire, que communi omnium Procerum Assensu conclusa est. Eodem die, 1a vice lecta est Billa, for the making of Felts, Hats, Coverlets, or Dornykes, within the City of Norwiche. Eodem die, 1a vice lecta est Billa, for Writs of Proclamations upon Exigents to be current in the County Palatine of Lancaster. Eodem die, 2a vice lecta est Billa, for the avoiding of Reservation of Rents, or other Profits, for the Gift of any Benefice. Eodem die, 3a vice lecta est Billa, for the Assurance of certain Lands passed from the King to the Mayor and Citizens of London, que communi omnium Procerum Assensu conclusa est. Eodem die, 2a vice lecta est Billa, to avoid Severance of Land from Houses, not leaving Thirty Acres with such House, que commissa est Episcopis Norwicen, et Gloucestren. (fn. 1) Domino Windesor, et Domino Wentworth, Domino Mountague Justitiario Principali Communium Placitorum, et Magistro Saunders, Servienti ad Legem. Eodem die, 1a vice lecta est Billa, against brawling and fighting in the Church. 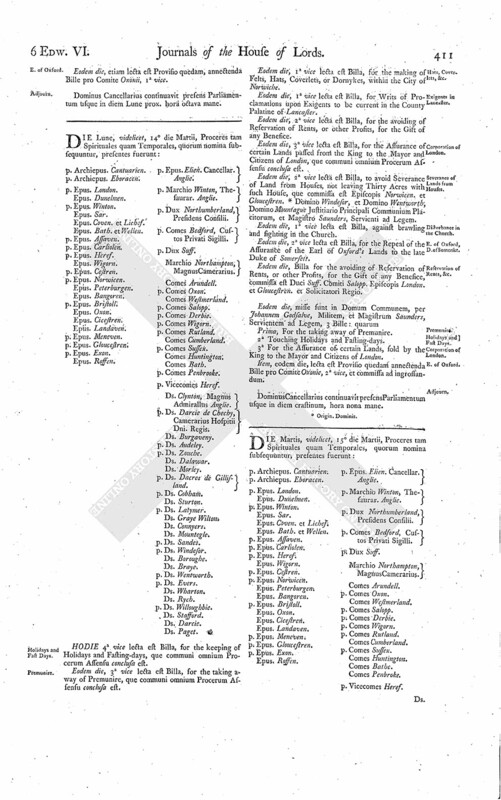 Eodem die, 2a vice lecta est Billa, for the Repeal of the Assurance of the Earl of Oxford's Lands to the late Duke of Somersett. Eodem die, Billa for the avoiding of Reservation of Rents, or other Profits, for the Gift of any Benesice, commissa est Duci Suff. Comiti Salopp. Episcopis London. et Gloucestren. et Solicitatori Regio. Prima, For the taking away of Premunire. 2a Touching Holidays and Fasting-days. 3a For the Assurance of certain Lands, sold by the King to the Mayor and Citizens of London. Item, eodem die, lecta est Provisio quedam annectenda Bille pro Comite Oxonie, 2a vice, et commissa ad ingrossandum.